What makes coaching so effective, and does emotional intelligence help? How? Here’s an infographic, report, and insights from 1138 professionals — business coach, life coach — and coaching clients from 88 countries. Focus on the client, asking challenging, reflective questions to deepen thinking about goals. Hold a powerful space for active listening. Work with emotional strengths, build mindfulness, and self-understanding. What are the obstacles that make it hard for clients to change? 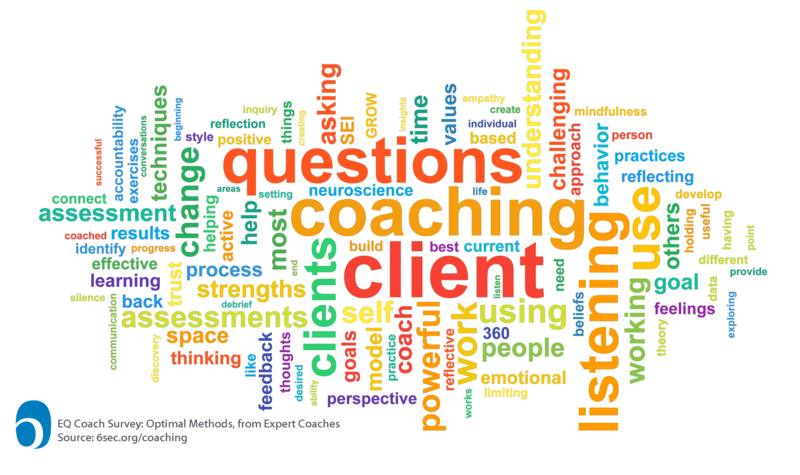 What coaching methods are most effective for clients to work through these issues? If emotional intelligence is helpful, why? This iframe contains the logic required to handle Ajax powered Gravity Forms. The survey includes professionals coaches (life coach, business coach, mentors), coaching clients, and people in the process of becoming coaches. What’s the role of emotional intelligence in coaching? We know from extensive research that the learnable, measurable skills of emotional intelligence are important at work, in school, and in life. Coaches and coaching clients agree: Emotional intelligence is invaluable. It’s good for coaching clients, but it’s essential for coaches. The question, “How important is it for coaches to have strong emotional intelligence to assist clients with the challenges you identified?” scored a massive 98% agreement that it’s essential. The question to coaching clients, “How important is it for clients to develop strong emotional intelligence to work through the challenges you identified?” scored 90%, or Highly Important. In what areas do coaches most need to develop? Whether a business coach, life coach, or a coaching client, respondents gave extremely high ratings to the importance of coach self-development. This item scored 98% on the 5-point scale, indicating it’s an essential ingredient. 34% use a wide range of other tools including self-developed surveys. Of interest to those using Six Seconds’ tools, the large majority (around 80%) use only Six Seconds assessments (SEI, Six Seconds Emotional Intelligence Assessments and VS, Vital Signs People-Metrics tools). In contrast, 69% of respondents using emotional intelligence tests published by others are also using additional assessments. We also looked at the respondents who focus on Six Seconds’ assessments. Among these, the importance of emotional intelligence scored 99%, and the importance of developing self-as-coach 97%. These incredibly high scores demonstrate that these Six Seconds coaches are highly focused on EQ, and our principle that positive change starts from the inside. The infographic below highlights three key questions, comparing the answers from highly trained coaches (over 200 hours on average; many have over 400 hours of training) vs those who are earlier in their professional development as coaches. The answers follow very similar themes, but the coaches with deeper expertise look deeper. For example, the newer coach answers often focus on behaviors where the seasoned coaches focus on the feelings and thoughts that drive behaviors. Thank you Anita! We agree! In addition to being a terrific launching pad for the coach/client relationship, the Six Seconds assessments add so much depth to the coaching conversation. They spark self-awareness, change, and help the client gain clarity around their purpose. I am always amazed at what new insights my clients gain from the debrief session and coaching sessions to follow. I highly recommend the Six Seconds emotional intelligence tools for coaches, no matter what your niche is! EQ is in today…that’s why I want to know more about it! Agree Josh. The ahaa moment when I use in Life Coaching all the competencies of KCG help me a lot to engage in conversation.. Yes, agreed! I am so thankful to you for this great read. I always wondered about the use of life coaching.